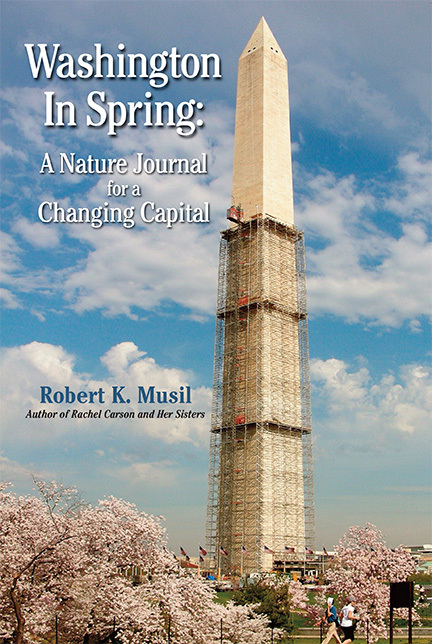 In this intimate and history-laden nature journal of the nation’s capital at its most glorious time of the year, Robert K. Musil pays homage to the noted nature writers who have explored Washington before him. From the moment Captain John Smith and his men pulled their barge aground at Little Falls on the Potomac and hiked to the Great Falls, the ever-changing beauty and bounty of Washington in spring has captured the imagination of writers who have also been moved to preserve it. White-bearded John Burroughs, friend of Walt Whitman, attended President Lincoln’s Second Inauguration and then hiked off looking for birds and butterflies. Burroughs wrote that the areas surrounding Rock Creek should become a national park. Musil follows a similar path and that of later writers like Florence Merriam Bailey, through Rock Creek Park and finds Red-tailed Hawks, woodland flowers, and the mysterious appearance at his feet of a Pileated Woodpecker that introduces a young couple to the glories of nature in the capital. Amidst the constant encroachment of urban sprawl and growing signs of climate change, find surprising signs of nature’s resilience and restorative powers from a bustling brood of Hooded Mergansers beneath construction at Huntley Meadows to a face-to-face encounter with a Barred Owl on the C&O Canal whose deep, black eyes commune with the creature whose eyes are magnified by binoculars.